October 22, 2011 – Journey to my heart…. I have heard it often, think before you speak. I have learned to practice this….most of the time. Today I saw this post and smiled. I love the invitation that is outlined in the word THINK. I believe that if you and I were to commit this to memory and practice this, our relationships would improve. 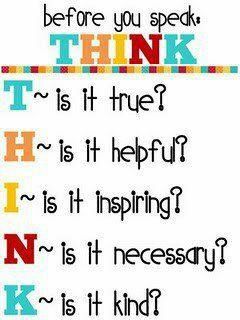 I believe this is not only a piece to be hung on the fridge to guide the communication of children…. This is a piece to guide the communication of humans! Practice something new this weekend ~ make sure your words are Truthful, Helpful, Inspiring, Necessary and Kind!